I'm on the road as this goes live! Expect a trip inspired prompt next week *wink* that may or may not include tall buildings, skylines or something along those lines! But this week, I'd like to concentrate on colour. In fact, I'd like to concentrate on single colours. Back in the day, we had WM#89 which called for a tone on tone effect but this week, I'd like you to be inspired by a monochromatic colour scheme. I use a lot of colour. I tend to mix them up in ways that others might not. I don't pay a lot of attention to the colours in my photos and often make up a colourful layout and then just add a photo on the top. 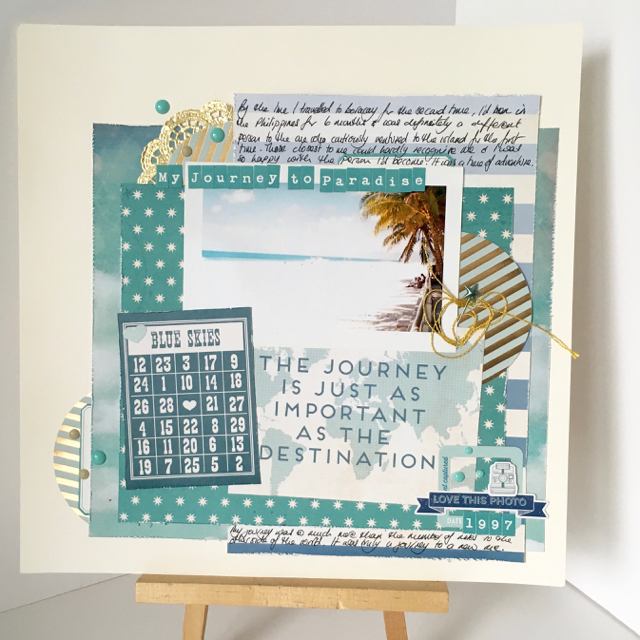 But recently, I had the privilege of using the Scrapabilly June kit which featured the Stargazer collection from Kaisercraft. 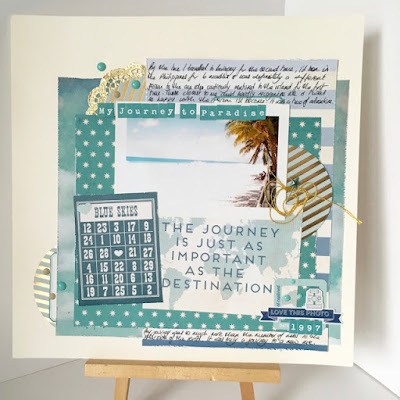 I think Kaisercraft often have collections which are quite monochromatic and this kit was no exception. I was suddenly a little unsure when I saw it but as I started mixing and matching the patterns, I totally fell in love with all the shades of blue with hints of grey or cream. 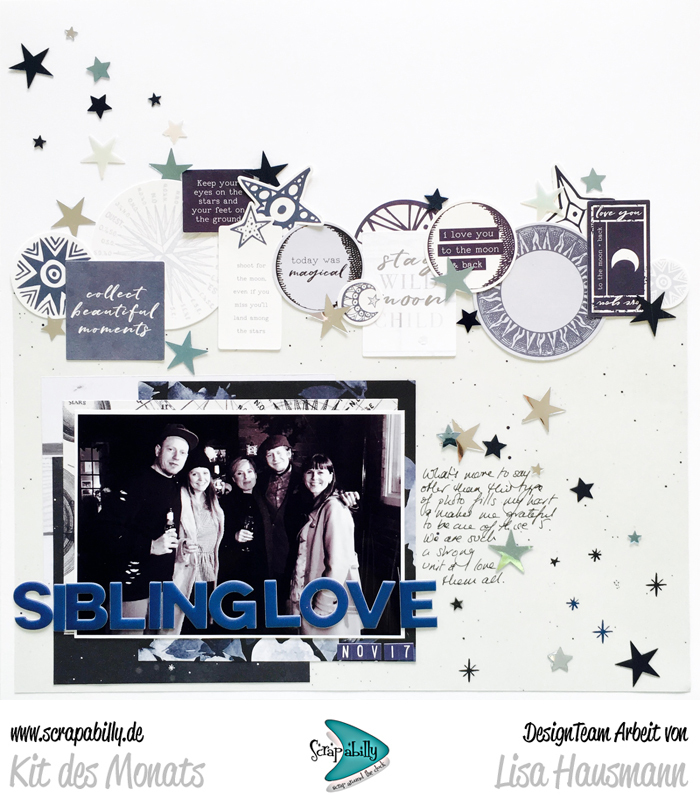 It was a stunning kit to use and I made four lovely layouts which are pretty much monochromatic. You can see them all in the gallery at Scrapabilly here. Take a single colour of choice and find as many items as possible in that same family - papers, embellishments, alphas etc and put them together to make an eye-catching design. Here's another one I found that seems to prove that I'm drawn to shades of blue! Here with a hint of gold. Of course, you could also use the idea of monochrome as part of your story - to describe your home or clothing style, even someone's personality, or a place such as a garden or a desert trip. I hope you can find somewhere to take this this week and that you'll share! You can do that in our Facebook group here. Tag your entry with #WMXX so we know exactly which inspiration you've taken.